Receive up-to-date news and information about industry trends, new products, seasonal tips and much more - each month, straight to you! Existing Customer? To sign up, go to My Profile, select the Email Preferences tab, and check the box for Newsworthy. Then click submit. Don't have an Orgill acount? Click here to sign-up for the newsletter. Retailers have a number of reasons for attending an Orgill Dealer Market. Maybe they want to find great deals, or visit with vendors to discover the latest and greatest products to hit the industry. The popularity of online shopping continues to grow. Each year, more and more consumers turn to their smartphone, tablet or computer to make their purchases. There were plenty of products and merchandising ideas to be found at the Spring Dealer Market, held last month in Orlando. 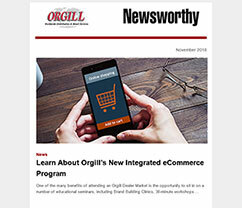 Orgill customers have access to thousands of products through their distributor. Buy Online Pickup In Store, or "BOPIS," is becoming the go-to strategy for brick-and-mortar retailers of all sizes. The independent home improvement store is alive and well.That's the resounding message heard loud and clear in the results of a 2018 study. With 38 locations across Texas, a legacy extending back to the company's founding in 1881. When the team at Minor Bros. Country Living encountered a setback, they used it as an opportunity. Lester Building Supply welcomes customers of all ages through its doors. The building materials store in Martinsville, Virginia, recently hosted a full store tour for a group of local elementary school students. With Christmas quickly approaching, it's time for your customers to straighten and tidy their homes for any family or friends coming to visit. Whether they'll have visitors for two days or two weeks, they'll be coming to your store. One day in 1948, a man named Billy Ray Alexander ran in to a local building supply store that had just opened in Wiggins, Mississippi, to make a small purchase. As he was leaving the store, the owner asked Alexander if he could make a quick delivery on his way to work. As an independent home improvement retailer, you know the importance of building a good relationship with your pro customers. There are a number of ways to do this. You can make sure you're offering them the products they need, and maybe even some extra services, such as delivery to their jobsites. Tim Bernard, owner of Crescent Lumber, has had a busy few years. In late 2016, he was in Palmyra, Maine, visiting the area to look at a piece of land a friend was considering buying for a business opportunity. During that trip, Bernard found a different parcel of land, which included 60 acres that he thought would make a good location for a fourth Crescent Lumber store. Winter weather is here. Ice and snow are a regular part of the forecast, and your customers will be looking for ways to remove them from their driveways and sidewalks. In addition, they'll want their homes to be warm and insulated, so they can stay comfortable while saving on their energy bills.